The vendor landscape of the global automotive sunroof market features several big as well as small player, however large public listed companies dominate, observes Transparency Market Research (TMR) in a recent report. The report states that the leading five vendors in the market, namely Aisin Seiki Co Ltd., Yachiyo Industry Co. Ltd., Valmet Automotive, Webasto SE, and Mitsuba Corporation, collectively held a nearly 64% of the overall market in 2016. With opportunities significantly rising in the sector of electric and hybrid cars, a number of companies are foraying into the segment of solar sunroofs. 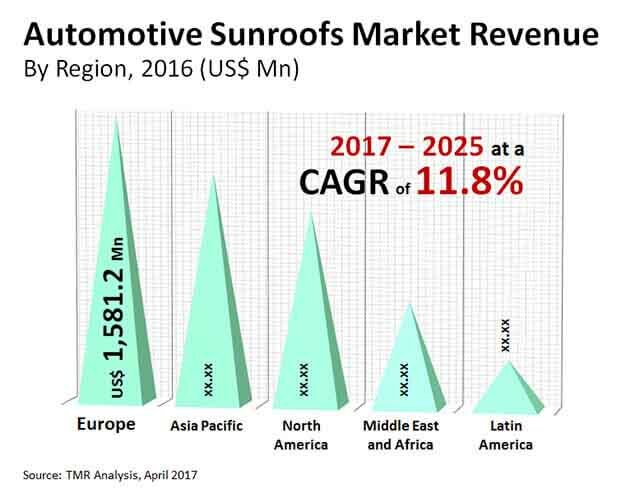 Product innovation, technological advancements, and acquisitions are the key competitive strategies adopted by the players in the automotive sunroofs market. The market is expected to witness a surge in the number of acquisitions as large companies will acquire small players to expand their product portfolios and geographical reach. Expansion of manufacturing facilities is also a key business strategy adopted by market players to strengthen their grasp on the market. Recently, Webasto SE announced in April 2016 that it was expanding its existing plant for roof systems in Hiroshima, Japan. Inteva Products, LLC also announced that it had established a new technical unit in Bangalore, India, in September 2016. Transparency Market Research estimates that the global market for automotive sunroof was valued at US$4,796.0 mn in 2016 and is expected to reach US$12,935.1 mn in terms of revenue by 2025, exhibiting a CAGR of 11.8% from 2017 to 2025. In terms of type of sunroof, the segment of in-built sunroof is presently the dominant contributor of revenue to the global market. The segment accounted for a massive share in the global market in 2016 and is expected to retain its top spot throughout the forecast period. It is expected to exhibit a promising 11.8% CAGR from 2017 to 2025. Geographically, Europe retained the leading position in the market for automotive sunroof in 2016, accounting for a 33% of the global market. The vast automotive manufacturing sector in the region provided the major thrust to the overall demand for sunroofs. Moreover, the vast population of affluent consumers and the high demand for premium cars also fueled the market for automotive sunroofs in the region. Over the forecast period, however, the Asia Pacific market is expected to outpace the Europe market for automotive sunroofs, chiefly owing to the thriving automotive manufacturing sector and the rising demand for premium vehicles across emerging economies such as India and China. Rising consumer demand for safety and comfort and the increasing global demand for premium vehicles are some of the key factors driving the global market for automotive sunroof market. In the recent years, the market has also significantly benefitted from the vast technological advancements observed in the materials used for manufacturing sunroofs. Manufacturers are increasingly shifting preference to long lasting high-tech materials like silicone and ethylene propylene diene monomer (EPDM) rubber products, which can also prevent/filter UV rays. The automotive sunroofs market has become competitive with major technological innovations and breakthroughs in solving leakage problems.